Just behind Momofuku Ssäm Bar, Momofuku Milk Bar East is the dessert shop of the famous Momofuku chain (there’s also one midtown west). The Milk Bar’s trademark dessert, the Cereal Milk soft serve ice cream, offers a new twist to an old favorite -- cereal in milk. The soft serve is sweet and a little salty, but completely true to its name; it tastes like Frosted Flakes and milk. 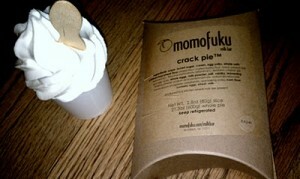 In addition, Momofuku Milk Bar serves sugar-saturated treats like the Compost Cookie (my personal favorite), which is a conglomeration of ingredients such as potato chips, pretzels, chocolate chips, and more savory and sweet “things.” The Crack Pie is a sugar-coma-inducing, melt-in-your-mouth pie. If you crave sugar and sweets, this is your nirvana. A little further east is the Chickalicious Dessert Club. The small shop is easy to miss when you're walking by, but once you've been there, you will never forget it. 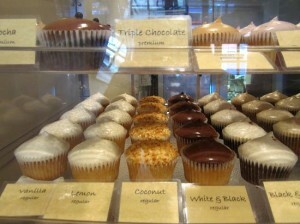 The Dessert Club offers treats like cupcakes, macaroons, éclairs, cakes, and cookies. The cupcakes are soft, light, perfectly moist, and offer just the right amount of sweetness. One of their most popular items, the Molten Lava cake, is baked right when you order it. Fifteen minutes later, you have a little piece of chocolate heaven, complete with a gooey chocolate pond in the center. You’ll need to exercise patience here – this little gem is worth the wait. Open daily until midnight (11 on Sunday). Last, but not least; is Spot, sitting in the middle of funky, bustling St. Marks Place. Spot features mainly distinctive seasonal dessert tapas. 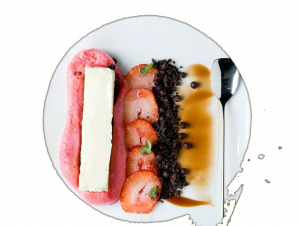 A staple tapas, the Yuzu Eskimo, features blackberries, raspberry foam, chocolate pearls, chocolate ganards and Oreo soil. In addition to the tapas, Spot has cupcakes (one-of-a-kind flavors like chocolate green tea fruit jam) and cookies as well as a wide variety of coffee and tea. All ingredients used are all natural. Spot is definitely worth a visit or two or three. This entry was posted on Sunday, March 13th, 2011 at 12:33 pm	and is filed under Stuff to Do. You can follow any responses to this entry through the RSS 2.0 feed. You can leave a response, or trackback from your own site.